Fed up with Internet Explorer 8 which is unstable at best? IE8 IE8 Beta 1 may occasionally crashes or not responding when browsing websites, and users have to close the browser with request to send the error report to Microsoft. The bugs or crashes happen more frequently especially if users using third-party add-ons such as Google Toolbar. This is generally expected as this is the first beta of IE 8. Beside, user interface of IE8 is generally similar to IE7, reducing the enticing for users who face problems when using IE8 to stay using it. 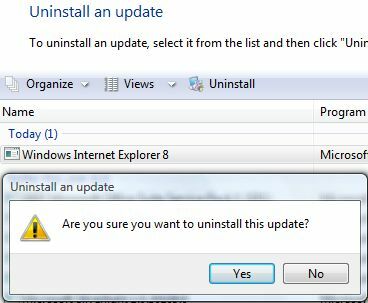 If you decided to rollback and revert back to original IE7 or IE6, it’s possible to uninstall IE8 to do so. IE8 can be uninstall by using Add or Remove Programs module in Windows XP, but in Windows Vista, Windows Internet Explorer 8 is not considered to be a ‘program’. Instead, IE8 is categorizing as an ‘update’. Thus, users will not be able to find Windows Internet Explorer 8 in “Programs and Features” of Windows Vista. If there is no option of IE8 been found on “Programs and Features” or “Add or Remove Programs” dialog box, or uninstallation of Internet Explorer 8 is unclean (causing error message such as setup cannot continue because a more recent version of Internet Explorer has been detected on this computer when trying to downgrade to IE7), try to manually run the spuninst.exe. To do so, go to C:\WINDOWS\ie8\spuninst\ folder (your drive letter may be different), and run spuninst.exe. Restart the computer after uninstallation completed.